How did you find porcelain dolls? I am curious where the hobby or interest started for you all. Where or how did you first hear about porcelain bjds? I was looking in the thread for the resin Limhwa ToYous and I thought, what is that big doll??? And now here I am, in so deep! My friend Annika was the one who introduced me to the porcelain Enchanted Dolls. This was back in 2009 and she had just ordered her dolls. At first, I wasn't very interested but once I saw how well they posed, I fell in love. It's thanks to the ED and Flickr community that I learned more about porcelain dolls and their talented makers. I remember seeing Marina B's work on Deviant Art years ago, it was a doll that resembled Snowwhite. I did not get into collecting but it did leave quite an impression on me. I did start at a later date to slowly collect resin dolls, mainly because the customising aspect really grabbed me. It was not until I started to make my own dolls that I figured out resin was not my material of choice. I made a lot of resin tests but it just did not get the 'skin' I was looking for. While after my first porcelin test I was sold XD So a year later I still struggle with porcelin but I do understand it a lot better now and I love it. Now I'm also looking at dolls from BIDolls and Vividdolls, for now I don't have any funds (killn is expensive ) but maybe in the future I'd love to be able to see other artists craftmanship and learn from them. I know people on the ED forum may have heard this story a few times, sorry lol! But here goes. I wanted to try my hand at art dolls. I couldn't decide what medium I wanted to use. I was perusing through art doll mags at the book store when I came across an article about Enchanted Dolls and I was immediately in love. My dear Tess (Bride of Frankenstein) was one of the doll pictures in the article, I thought I'd never seen anything like her before, she was kind of scarey real. Thus the adventure started! Aww that's so cool that you were introduced to them via my photo, Allurose, it warms my heart! I unfortunately can't remember who mentioned it or in which thread, but someone mentioned Enchanted Dolls on Den of Angels and I felt this inexplicable pull and checked the enchanteddoll.com site and I was done. I specifically remember being on the site and on Chad's flickr for days, just gazing at these amazing dolls. So cool to read everyone's story! Lilith I think it is just SO COOL that you were able to bring home one of the first porcelain BJDs you saw. What a lovely story! I don't remember how I found Enchanted Dolls, but they were my introduction to the bjd world entirely. After looking around and seeing a lot of resin dolls, and anime type aesthetics, I realized that what Marina did was on a higher level artistically. This was in 2008. I tagged her website, and have been looking at it nearly daily ever since then. The fact that I turned down the opportunity to buy Marina's dolls when they were selling for $2,000 because I claimed "no one would ever pay that much for a doll" still makes me shake my head to this day. I am a real newby to the world of porcelain dolls. I started down this road purely by accident. It all began when my mother asked me to customize a Barbie for a friends daughter, which I did, and more requests followed for Tonner dolls and Resin dolls. I never had any inclination for collecting dolls myself- I just loved doing the repaints and costumes for doll collectors. Whilst researching something or other on the internet, I came across Enchanted Dolls and was blown away- I then realised there was a whole other world with these porcelain beauties in it and I loved the artistry in them! To cut a very long story short, I fell in love with Paperwhite Dolls, and was lucky enough to contact Teri when she had one available! I now have another two dolls by SisterFox, a very talented Russian artist, and the rest as they say is history! I first saw ED's years and years ago, I must have been looking at the old web site for about 2 years and then saw on ZOZ that Biscuitbear had bought one. I immediately got on the list and about 4 months later my turn came up. Marina offered me the choice of 1 or 2 dolls. Thinking I could always get another and since 1,000 dollars seemed high for a doll I opted for just one. I kick myself everytime I tell this story. But I got my doll in about a month or 2 was floored by her and asked to be put on the list for another. Well they had taken off by then, and I never got that second doll. LOL. Anyway I have to say I have never liked a doll I owned as much as my ED, and if I had purchased 2- I probably would not have loved the one so much. I did get to purchase 2 resins and share them with my doll friend down the road. I am so happy there are more and more dolls of this nature popping up. My acquaintance with balljointed and porcelain dolls started at the same time, when (2 or 3? years ago) I accidentally stumbled upon photos of dolls of Marina Bychkova. I then took a great interest in painting on the skin with henna, mehndi, and looked beautiful photos for inspiration and then I saw henna tattooing doll "Silk Road", and then the rest of the dolls ... And when I saw "The Vessel", she is on my avatar, my life has changed irreversibly! Now I have my first porcelain BJD from Anastasia Lutsenko, I ordered it almost a year ago and waited patiently until it is ready. Coincidentally, I received the parcel the next day after my birthday, a gift of fate! Before that Anastasia made ​​dolls from Flumo and my doll - one of her most-the first porcelains. My first exposure to BJD's was on an evening when my ex-husband and I were on a date at the bookstore. I saw Marina B's Enchanted Dolls on a magazine cover(Haute Doll, 2009ish?) , and out of curiosity picked it up. I took the magazine and took it to show him- we were both blown away. I had never seen a doll that I actually liked and wanted to have. My mother was a doll collector when I was a child, and my association with dolls was boring trips to flea markets and antique shops, sometimes dolls shows, and also little heads, wigs, arms, and doll shoes in every nook and cranny of our house. I did try to make a few little dolls in college as means to illustrate stories. (Wendy Froud's book, A Midsummer Night's Faery Tale, was a previous "wow" moment for me, seeing dolls used for illustration). By the time I saw Marina's website and the Enchanted Forum, her work had already taken off and dolls were difficult to get. It took me a year or so I think to decide to try making my own. AT the time I had never been on a forum, had never posted anything anywhere on the internet, never posted photos anywhere besides ebay. So this whole "doll thing" I'll call it affectionately, changed my interaction with the world in general, and I'm happy to have gotten to know people from all around the world through the Enchanted Forum. 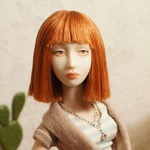 Gosh, it's amazing how many of us have been introduced to the world of porcelain ball jointed dolls via Marina Bychkova. I'm another one! I stumbled upon a picture of Sapphire, while trawling the internet in 2011 and I was flabbergasted that such a beautiful doll even existed! I decided then and there that an ED was a doll I just couldn't live without, but unfortunately my discovery came much too late to be able to order a doll and now, with their scarcity and skyrocketing prices, a porcelain ED can only be for me, a dream.